“When people ask me who our main competitor is, I tell them it’s injection molding,” Stephen Nigro, President of 3D Printing at HP (Palo Alto, CA), told the media during a conference call in advance of Rapid + TCT, industry’s largest 3D printing and additive manufacturing conference, which began today. Ambitious? You think? Noting that 3D printing is still a blip in the grand scheme of the $12 trillion manufacturing sector, Nigro envisages a vast expansion for the technology in the years ahead, spearheaded by HP’s Multi Jet Fusion (MJF) technology. MJF allows materials to be engineered at the voxel, or volumetric pixel, level, enabling the printing of quality parts 10 times faster and at half the cost of current 3D printing techniques, according to HP. The company made news in March 2017 with the opening of its 3D Open Materials and Application Lab at its Corvallis, OR, facility. This time around, Nigro previewed announcements that the company is making this week at the Rapid + TCT event: The official unveiling of the new HP Partner First 3D Printing Specialization program and the addition of Henkel AG & Co. to its partner companies, among them. “At last year’s event, we announced the product. This year, we’re highlighting scalability,” said Nigro. The HP Partner First 3D Printing Specialization program includes more than 30 hand-selected partners in North America and Europe that have been trained and certified in HP’s Multi Jet Fusion technology. The program enables them to rapidly deliver HP’s 3D-printing technologies to customers and scale up to meet their needs. The partner companies will bring best-in-class expertise and knowledge of HP’s Multi Jet Fusion technology to customers deploying the solutions, as well as value-added services such as the enablement of new applications and industry-leading response time and service quality, said HP. Fast Radius, Forecast3D, Go Proto, Materialise, ProtoCAM, Proto Labs, Shapeways, Sigma Design and 3D Prod are among the companies installing HP 3D printing systems and beginning to deliver production-quality HP Jet Fusion 3D printed parts. Noting the importance of potential customers being able to “see and touch” the Multi Jet Fusion system and its output, Nigro also announced the opening of more than a dozen 3D Printing Reference and Experience Centers across North America and Europe. 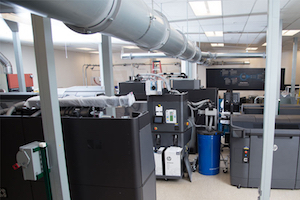 The centers will enable testing and qualification of new 3D printing use-cases in controlled environments, providing customers a simpler path to advance from prototyping to full-scale 3D production, said HP. The initial centers will be located in Allentown, PA; Alpharetta, GA; Carlsbad, CA; Corvallis, OR; Livonia, MI; Louisville, KY; Manchester, CT; Milpitas, CA; Palo Alto, CA; San Diego, CA; and Vancouver, WA in the United States; and Raon-l’Etape, France; Leonberg, Germany; Eindoven, Netherlands; Barcelona, Spain; and Birmingham, UK. Calling the open innovation platform “the biggest innovation HP has delivered” in the 3D printing space, Nigro took the opportunity to welcome adhesives specialist Henkel to the fold of materials suppliers developing applications at the lab in Corvallis. It joins Arkema, BASF, Evonik, and Lehmann & Voss to the open platform. Their participation, added HP, is helping to expand the availability of new materials and address a broader set of applications, lower materials and development costs, drive speed and performance improvements, and create new possibilities for part properties that address specific industry needs. Henkel, an $18 billion global supplier of high-performance adhesives used in critical applications in the medical device, electronics and transportation vehicle assembly fields, is focusing on the development of novel powder materials for use with HP Jet Fusion 3D printers. Rapid + TCT runs through May 11 at the David L. Lawrence Convention Center in Pittsburgh, PA. HP is exhibiting in booth 2517.